The Orchestra will present a concert featuring Cesar Franck’s Symphony in D minor, the Belgian composer’s only symphony, as its main item. Concert also includes the popular Suite Pastorale by Emmanuel Chabrier and concerto for harp and orchestra by Gabriel Pierne. Soloist is Sydney based and internationally experienced harpist Emily Granger (pictured). Emily has studied extensively in her native United States and now enjoys a busy professional life. Conductor is the orchestra’s musical director Joanna Drimatis. For more information contact president Lisa Pont 0421 932941. 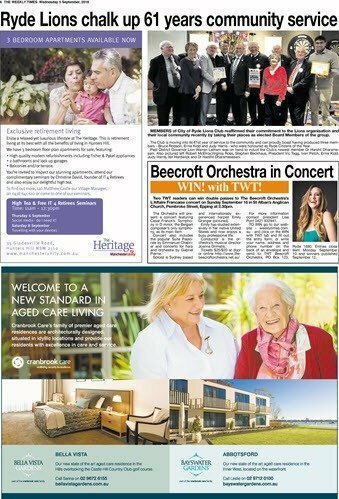 TO WIN go to our website – weeklytimes.com.au – and click on the WIN with TWT tab and fill out the entry form; or write your name, address and phone number on the back of an envelope and send to TWT Beecroft Orchestra, PO Box 123, Ryde 1680. Entries close 9am Monday September 10 and winners published September 12.